Words are important. Writers know that. Now researchers are using words to create algorithms to help prevent suicide. And they are basing their research on Virginia Woolf’s use of words in her writing before she drowned by walking into the River Ouse on March 28, 1941. Researchers from St. Joseph’s Healthcare, McMaster University and the University of Rio Grande do Sul in Brazil have analyzed that writing to create a word cloud from the 46 documents Woolf wrote during the last two months of her life, along with a cloud created from random samplings from 54 of her letter and diary entries prior to that period. The contrast is stark, explains Dr. Diego Librenza-Garcia, a post-doctoral fellowship at the university in Brazil. The cloud compiled from her writing during the final months of her life includes such words as: little, miss, war, nothing, never, can’t and don’t, negative words that indicate Woolf’s hopelessness. In contrast, the cloud compiled from happier times in Woolf’s life, frequently used words such as love, tomorrow, nice, hope and good. The researchers hope to design an app that would build an algorithm for each individual patient that will analyze texts, emails and social media posts of at-risk patients who have consented to participate, so their caregivers can be alerted when intervention is needed to prevent suicide, according to an article in The Spectator. The research team’s study was published Oct. 24 in PLOS One, a peer-reviewed open access scientific journal. 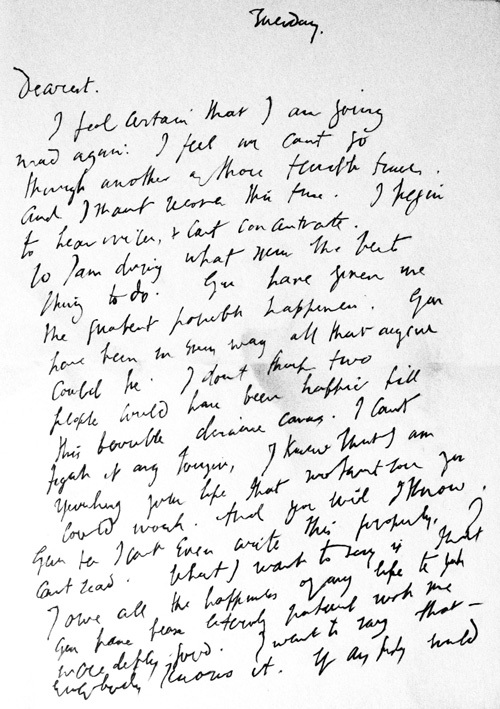 A three-page letter written by Virginia Woolf to Philip Morrell will be auctioned this week by British auction house Dominic Winter Auctioneers. Chris Albury at Dominic Winter, which has a guide price of £1,000-£1,500 on the letter, said that “any letter from Virginia Woolf is exciting, and there is always a mystique concerning any that might illuminate the tangled relationships of any of the Bloomsbury group and Garsington Manor set”. The Morrells lived at Garsington Manor in the 1920s, with Woolf a regular visitor. Philip Morrell was a British Liberal politician who was married to literary hostess and muse Lady Ottoline Morrell. The Morrells both had close friendships with Virginia, and both expressed amorous feelings for her throughout their friendships. She goes on to tell him that she is living in Sussex; the letter was written on 12 July, shortly after the start of the Battle of Britain, and Woolf says that she is “exposed to raids, but in the air and with flowers, rooks, gulls, and our lovely view”. View the auction catalog for more information on the auction and letter. The University of St. Andrews has acquired an archive of dozens of letters from Virginia Woolf’s friends and family collected by biographer Brownlee Kirkpatrick. The collection includes two previously unseen photographs of Woolf. The material will be made accessible to academics and the general public in a Special Collections Reading Room at the University of St Andrews. The Special Collections staff and the staff in the school of English have been working together to develop a Virginia Woolf and Hogarth Press research collection. “This archive will put St Andrews even more firmly on the map as a world-ranking centre for the study of literary modernism in general and Virginia Woolf as one of its great proponents in particular,” Woolf scholar Susan Sellers told the Herald Scotland. She is also the author of the award-winning novel Vanessa and Virginia. It was 74 years ago today, on March 28, 1941, that Virginia Woolf left two suicide notes behind, walked out of Monk’s House and across the Sussex Downs and headed for the River Ouse. With a stone in her coat pocket, she waded into the river and drowned. She is still missed today. Many tributes have been made to her on the anniversary of her death. Eight years ago, a video, The Adventures of Virginia Woolf, was posted on YouTube that speculates on what Woolf would have accomplished if she had chosen to live on that fateful date in March of 1941. Four years ago, the Elite Theatre Company presented the world premiere of Arthur Kraft’s drama “Goat,” about what might have happened if a psychologist had prevented Woolf’s suicide. That same year, her great niece, Emma Woolf, wrote an article for The Independent, “Literary haunts: Virginia’s London walks,” that speculated about what Virginia Woolf would have thought of today’s London. “The Writer’s Almanac” has payed tribute to her. And each year on this day, social media lights up with posts that commemorate her life, her work and her death, making Woolf a trending topic. 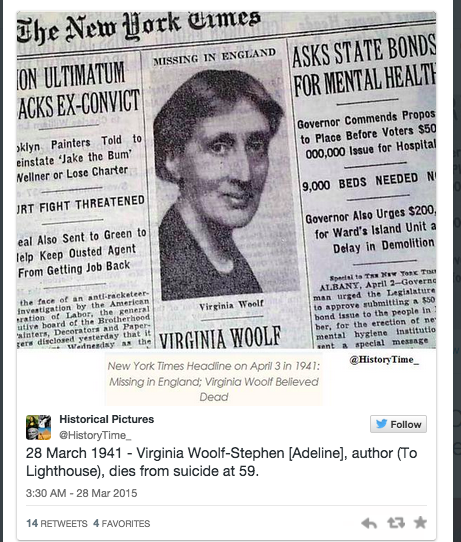 One example is @HistoryTime_’s Twitter post below that features a photograph of The New York Times coverage of her death. The perfect accompaniment to that is the video of actress Louise Brealey’s poignant reading of Woolf’s last letter to Leonard, which is posted on The Telegraph website. A video of Brealey reading the letter at the Hay Festival is also available on YouTube, but the audio is not as pristine. Screenshot of Louise Brealey reading Woolf’s last letter on The Telegraph website. Here are several Woolf sightings worth a read. And the second one is generating some heat on theVWoolf Listserv. 1. 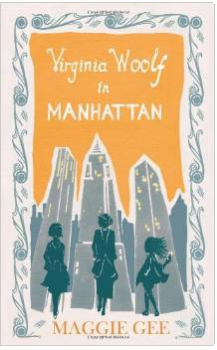 Maggie Gee explains how she came to write Virginia Woolf in Manhattan in The Guardian, Sept. 19, 2014. 2. “Virginia Woolf, Edith Wharton, and a Case of Anxiety of Influence” in the New Yorker, Sept. 19, 2014. According to Stuart N. Clarke, Woolf acknowledged receipt of a copy of The Age of Innocence in an uncollected letter to publishers Messrs Appleton & Co. on 18 Nov 1920. 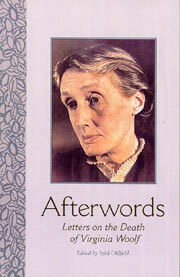 The letter was published in the January 2011 edition of the Virginia Woolf Bulletin. In that issue’s accompanying note, Stephen Barkway discusses Woolf’s published comments on Wharton and Wharton’s irritation. 3. Review of Arctic Summer by Damon Galgut, a fictional biography of E.M. Forster in the Washington Post, Sept. 18, 2014, that includes “lightly fictionalized” accounts of meetings with Virginia and Leonard Woolf. 5. Professor’s new book explores theories of place in the Bowdoin Orient, Sept. 12, 2014. The People, Place, and Space Reader, a new anthology dedicated to scholars writing about the ways in which people inhabit the space around them, includes an excerpt from A Room of One’s Own. 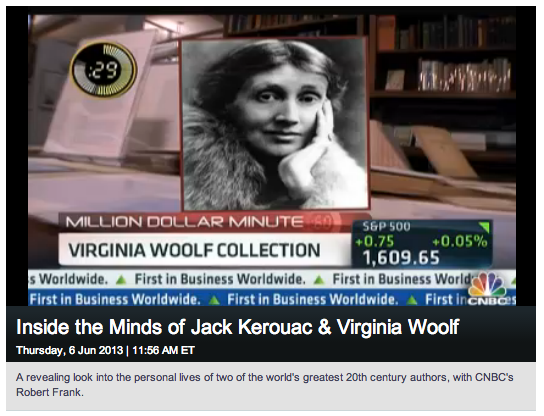 A CNBC story reports on a collection of Virginia Woolf’s letters and other items that is for sale en bloc for $4 million. The letters are being sold by Glenn Horowitz Bookseller in Manhattan. They include letters from Woolf to her nephew Julian Bell, as well as letters from Leonard Woolf, Vanessa Bell and Vita Sackville-West. The most poignant, said Horowitz during the CNBC interview, is one written by Vita Sackville-West, describing Woolf’s suicide and the days leading up to the discovery of her body. “It’s really one of the most touching collections of letters I’ve had the privilege of handling,” Horowitz said. The private collection was built over a period of 40 years by William B. Beekman, who started collecting Woolf items as a Harvard undergraduate before Quentin Bell’s 1972 biography brought her renewed interest from the academy, according to Horowitz’s site. Included in the collection are items that span Woolf’ life, such as photographs, letters, inscribed books and dust jackets. Although the CNBC story put the value of the collection at $4 million, the Horowitz website prices it at $4.5 million. The collection was put on the market and exhibited in East Hampton last July. In 2011, Horowitz published a digital catalog of Bloomsbury materials to its website. Virginia Woolf, The Hogarth Press, and The Bloomsbury Group contains more than 150 first editions, association copies, letters and more. New work from Virginia Woolf will be out this summer. The work appeared in The Charleston Bulletin, a family newspaper founded by her nephews, Quentin and Julian Bell, in the summer of 1923. The vignettes, written or dictated by Woolf between 1923 and 1927 and published in The Charleston Bulletin’s Supplements, describe incidents and individuals of Woolf’s family and household, including servants and members of the Bloomsbury Group. Quentin Bell provided the illustrations. Helen Melody, curator of modern literary manuscripts at the British Library, says the work is likely the last unpublished work of Woolf. 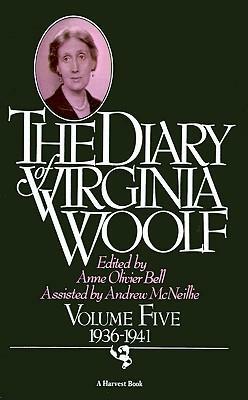 Yet Stuart N. Clarke, editor of The Essays of Virginia Woolf, Vol 5. and a member of the Virginia Woolf Society of Great Britain, maintains that each issue of the Virginia Woolf Bulletin includes at least one previously unpublished letter by Woolf. They include letters to Lady Aberconway, Mrs Easdale and Winifred Holtby. 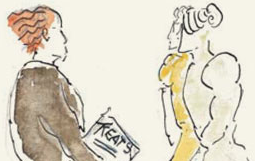 Clarke says the Bulletin will soon include a number of letters written by Woolf to Lady Colefax. The British Library, which acquired the works in 2003, will publish The Charleston Bulletin Supplements for the first time this June.